Sharkey Hot Springs in Idaho is a popular year round destination with 2 soaking pools for visitors. Sharkey Hot Springs is a wonderful scenic day trip you’ll want to experience frequently. Complete with all the amenities for an ideal day out with friends and family including picnic tables, changing rooms, restrooms, and a large group fire ring. Sharkey Hot Springs located off of the Warm Springs Wood Road section of the Lewis and Clark Backcountry Byway making this an ideal stopping off point if you are enjoying a Lewis & Clark Byway drive. Popular day activities (no camping) visitors enjoy while at Sharkey Hot Springs include mountain biking, picnicking, scenic viewing, and certainly long hot soaking. Mountain Biking in Salmon Idaho area offers endless trails to explore. 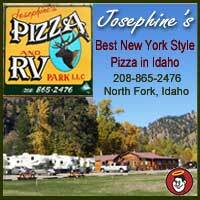 Mountain Bike Rentals are available in Salmon Idaho. Picnics and snacks are welcome at the Sharkey Hot Springs. Please ensure your drinks and containers are in plastic as NO GLASS is allowed. You may want to bring your camera as the natural scenic views at Sharkey Hot Springs are amazing. While visiting Sharkey Hot Springs, please leave your dogs at home as NO DOGS ALLOWED. 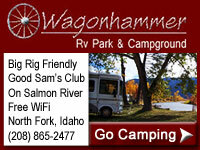 If you are a visitor to the area, Salmon Idaho offers pet boarding even just for the day. Enjoy a comforting long hot soak, but please leave the soap, shampoo or detergents at home as these are not allowed. Accessibility: By car, however, during winter months access may be limited to snowmobile. Leaving Salmon Idaho drive southeast on Highway 28 for 19 miles to Tendoy Idaho. Turn left at the Tendoy store and drive 300 yards to a “T” intersection. Turn left at the “T” and drive north approximately 3 miles to a “Y” intersection. Turn right at this “Y” intersection onto the Warm Springs Wood Road section of the Lewis and Clark Backcountry Byway. Drive for approximately 1 mile and turn left at a fork in the road. Drive for approximately 1 more mile to reach Sharkey Hot Springs. The Sharkey Hot Springs is maintained by the BLM Salmon Field Office. They complete weekly maintenance for the enjoyment of soakers.